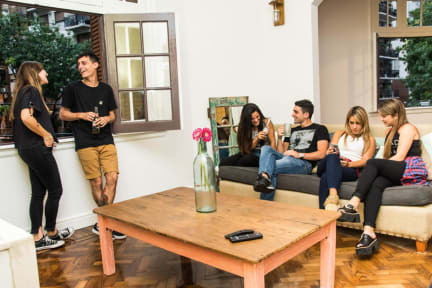 Benita Hostel is located in the popular area of Palermo and within a a few minutes walking distance of Recoleta, ideally situating us in the heart of Buenos Aires. We are 500m away from Santa Fé Avenue- shops, cafes, restaurants, mall, ATM's- as well as a 5 minutes walk from the city's metro and bus network. From Benita, you will have easy access to the main attractions and areas to be, such as Plaza Serrano in Soho. Our building was constructed at the end of the 19th century so is a real gem and it has, of course, been fully renovated and designed to make it the charming place it is today. We offer comfortable and spacious rooms, be it a double room with private bathroom and TV/ Netflix or our spacious 4 and 6 bedroom dorms with access to the shared bathrooms. All bedrooms are equipped with high quality mattresses, comfy duvets & pillows and ceiling fans to guarantee the rest that you need. There is access to WIFI throughout the property. Benita also has a fully equipped kitchen and a social area which is comprised of an open plan dining/ drinking area and chill space (with Drinks/Netflix/Music) and a giant roof terrace, to ensure the social and communal atmosphere of your traveller destination in Buenos Aires! To offer you more amenities, we have access to bars, supermarkets, 24/7 kiosko, pharmacies, restaurants and bicycle path within a 100m of the hostel. Ottimo ostello nella zona di Palermo, staff gentilissimo e sempre disponibile. Zona comune dove conoscere altri viaggiatori. Raccomandabile..